Click on the images to see enlargements with captions. 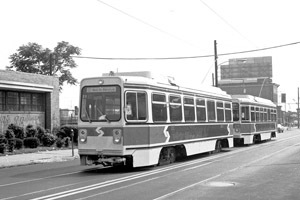 SEPTA's design for city and suburban trolleys stands the test of time. 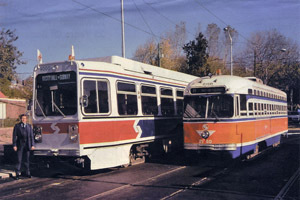 In the late 1970s, SEPTA management decided to it was time to replace the oldest of its fleet of PCC trolleys. Informally dubbed air cars due to their pneumatically operated brakes and doors, these cars had been placed in service in 1940, 1941 and 1942. Among the reasons stated, was the fact that the spare parts needed to maintain these streetcars were becoming increasingly hard to find. The federal Urban Mass Transit Administration had urged the creation of a BSF Committee, of which Boston and San Francisco were the two active members (thus the name BSF). A consultant was hired by the committee to produce a specification for a US Standard Light Rail Vehicle (SLRV). The winning bidder was Boeing Vertol. Assembly would take place at the Boeing Vertol military helicopter plant just outside Philadelphia. Orders for large fleets of the technologically advanced articulated Boeing SLRV were placed by Boston's MBTA and by San Francisco Municipal Railway. It was UMTA's hope that when it came time to replace aging fleets of PCC cars, those cities that still had streetcar systems would order the US Standard LRV. It turned out that only San Francisco and Boston would do so. Boeing's lack of experience in building for the streetcar environment and it's UMTA-urged use of aerospace-experienced suppliers, plus its use of unproven in-house designs resulted in a car with many problems in the areas of functionality and reliability. Problems ranged from electronic and air-conditioning malfunctions to sticking doors to a tendency to derail when rounding tight corners. Problems plagued the Boeing SLRVs to the point that in Boston, MBTA maintenance personnel were not able to keep up with the constant repairs the cars required. MBTA refused to accept delivery of the final 50 cars it had ordered. 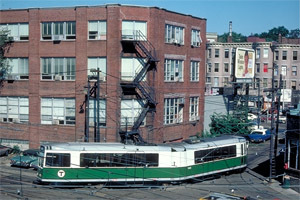 By the late 1970s, many of the Boeing cars were removed from service and stored for years in the unused Tremont Street subway. 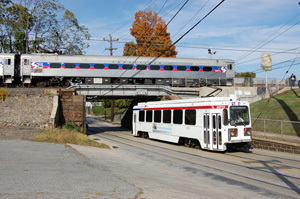 Fortunately, because of internal dithering and difficulty in obtaining funding for a purchase, SEPTA avoided the Boeing SLRV fiasco. 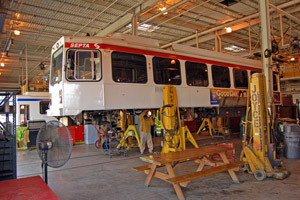 Eventually,SEPTA engineers instead set to work procuring a trolley car that would work on SEPTA's tracks, using the SLRV specifications as a starting point as insisted upon by UMTA. In accordance with UMTA's desire that only existing proven designs be proposed, SEPTA'S specification allowed both single cars of Toronto's CLRV dimensions and articulated cars of SLRV dimensions. The lowest bid was for a 50 foot car proposed by Kawasaki Heavy Industries (KHI) and this was accepted. 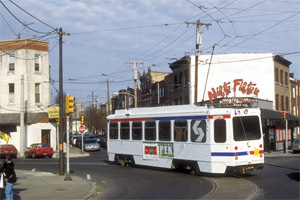 Kawasaki had little recent streetcar-building experience, and had to rely heavily on guidance from SEPTA staff to ensure that their designs would work well in the Philadelphia environment. Because the new car would serve the subway-surface tunnel, extensive clearance testing was carried out. In addition, the new car would need to negotiate the extremely tight curvature of Philadelphia's trolley track: 33 foot radius in many locations (10.0 meter radius). 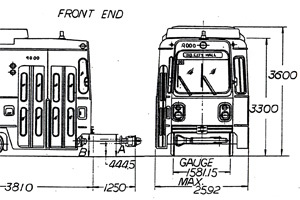 In a concession to what was the style for LRVs in the mid-1970s, a flat front was specified. Kawasaki Heavy Industries was awarded the contract to construct 112 single-end city trolleys, and 29 larger but similar double-end suburban trolleys. 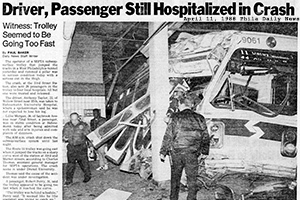 Two pilot cars were delivered in early 1980 to the City and Suburban divisions, just 14 months after the award of the contract. Not surprisingly, there were functionality and quality problems with the equipment produced by some US suppliers, but most were rectified in the following 12 months. The remainder of the fleet was delivered in 1981 and 1982. Scroll down to the bottom of this page to view the Kawasaki LRV's technical specifications. The design of the Kawasaki LRV, although in many ways a success, could not match one of the PCC cars' great design features: the PCC car's light weight. The PCC car weighed, on average, a very reasonable 18 tons. This light weight made the PCC car capable of both good performance and reasonable power consumption (but as has been pointed out, the PCC was also less able to endure minor collisions, wretched track conditions, and corrosion from road salt). 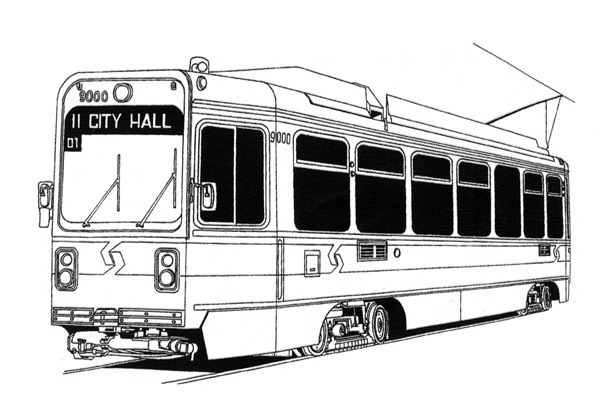 The Kawasaki city LRV, with a more robust construction, more corrosion resistance, better insulation, couplers and air conditioning weighs in at nearly 29 tons (the larger suburban LRV weighs about 30 tons). An even-handed comparison notes that the Kawasaki LRV spends less time being repaired; on the other hand the Kawasaki cars' greater weight causes more wear and tear on the tracks, and power consumption is greater. All things considered, the SEPTA Kawasaki LRV has been a success. At the present time (November 2012) the fleet has been providing dependable service for thirty years. Among the firsts that can be credited to the KHI streetcar are the use of stainless steel in the underframe, use of a roof-top air conditioning module, and use of the Vetag for electronic control of track switches and for car location information. Despite the lack of ADA-mandated handicapped access, there are no immediate plans for the fleet's replacement. 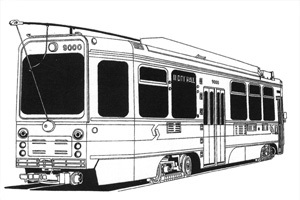 In the 1995 update of his volume Philadelphia Transit Vehicle Plans, transportation historian George Metz summed up the Kawasaki LRVs this way: the "so-called 'K' cars, while not as handsome as PCC cars, are comfortable, quiet and well-lit, with large windows and smooth acceleration... or what the public has always wanted in a transit vehicle." and here to view a roster of the Kawasaki SEPTA Suburban (Red Arrow) Division LRVs. 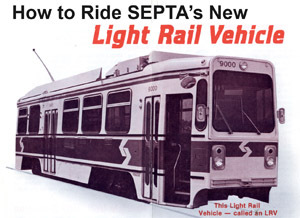 To view a 2-page brochure distributed to SEPTA riders in 1981, click here.